Now that Monster Hunter World has dropped on PC, you might be needing a helping hand with searching out some of the game’s more useful materials. So here’s where to find the Aqua Sac, Poison Sac, Electro Sac and Flame Sac – all frequently sought after crafting items – in Monster Hunter World. Gear is everything in this latest Monster Hunter. Not only does it look awesome, but your equipment forms the basis the game’s entire progression system, where rather than your Hunter growing stronger over time, it’s your armour and weapons that get better. 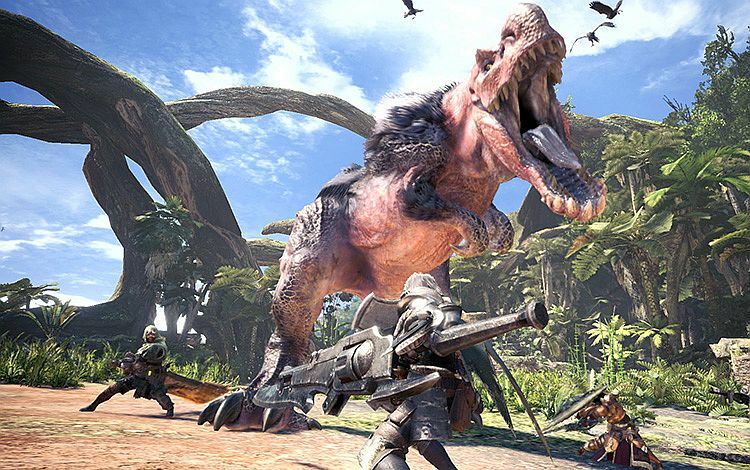 Crafting the best weapons in Monster Hunter World then – as well as Monster Hunter World’s best armour – is super important, and to craft that gear you need materials. The best materials aren’t easy to find, with most appearing as rare – or at least infrequent – drops from large monsters. So we’ve fought our fair share of Monster Hunter’s most dangerous beasts to find them. Investigation quests are your best friend when searching for these sacs. You have an additional chance to get them at the end of the quest, which cuts down on the grind. You get Aqua sacs from the killing huge, mud-dwelling Jyuratodus in Wildspire Wastes. Look for them in the wetter areas of the map. These slippery Piscene Wyverns thrash and slide about in their swampy habitat and have a natural resistance to water elemental damage. They are however weak to both thunder and fire elements, so use this to your advantage to take them out. Aqua sacs are often obtained as rewards, so completing Investigation quests which feature Jyuratodus are the best way to farm them effectively. Poison sacs are obtained from Pukei-Pukei in the first area of the game – the Ancient Forest. The Pukei-Pukei might look a bit like a huge chameleon, but is actually a Bird Wyvern that attacks with poison – so it’s not surprising you get the poison sac from it. It’s weak point is its underbelly, so you’ll have to get in close to do the most damage. Thunder elemental damage works well, so keep that in mind. Paralysis is also good, since Pukei-Pukei can run away from stronger enemies. You can get Electro Sacs from Tobi-Kadachi in the Ancient Forest area of Monster Hunter World. You can find them in the higher parts of the map, where they glide and swoop at you. These fast, Fanged Wyverns are dangerous foes, but are weak to water elemental damage – use that to your advantage to take them down efficiently. It’s easy to get hit from behind as the Tobi-Kadachi move quickly around, so try to pen it into one spot, and pack some thunder resistant armour. You find Flame Sacs by defeating Anjanath, giant T-Rex-like Brute Wyverns that you can find – once again – in the Ancient Forest area of Monster Hunter World. Anjanath are big and lumbering, but tireless, and they’ll chase you down all over the map if you make one angry. They’re weak to water and ice elemental damage, but have attacks that can hit out in all directions, so try to get in and out as quickly as you can with your strikes. Since its release Monster Hunter World has been a wild success, shipping 5 million units in its first three days on the market. If you’re trying to craft cool armour and don’t want your Palico friend to be left out, trying completing the Horizon Zero Dawn crossover quest and bagging the Watcher set for your furry companion. The post Monster Hunter World: Where to find the aqua sac, poison sac, electro sac and flame sac appeared first on VG247.